Google Launches the Stunning LG Nexus4 smartphone . Its the Best of Google Android Phone, named NEXUS 4, for its 4 inch form factor. The New nexus 4 is having most advanced Photo Camera, which has the sphere shooting mode . 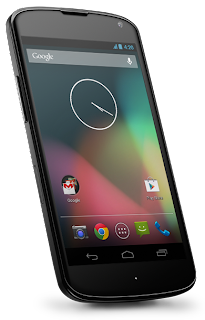 The LG manufactures Google Nexus4 smartphone records full HD 1080p videos with the time lapse continous shooting mode. The Nexus 4 is having the Gesture Typing, which means one can glide your finger over the letters to compose emails or texts in a snap. Get a Life like feeling view with the 1280 - 768 pixel resolution display , which is protected by Scratch resistant (Scratch free) corning Gorilla Glass2. While out of all the features that Android Phones (with Jelly Bean OS ) comes up, my favorite is the Google Wallet and Android Beam . With the Android Beam , the Near field Communication (NFC) enabled Android devices can share photos, videos, contacts, apps wirelessly, back to back. Also a notable feature is that Nexus4 can imports your favorite iTunes music with the help of Music Manager. Being a new rush entry for this android Phone , including the Nexus7 and Nexus 10 , a real battle groud is set by the 3 most influential Companies, with there latest Products in the last 4 days. First it was iPad Mini by Apple, than the Microsoft 8 enables Windows Surface and not the Google Nexus. It seems for me that , the winner will be the one who can manage the likes of People.